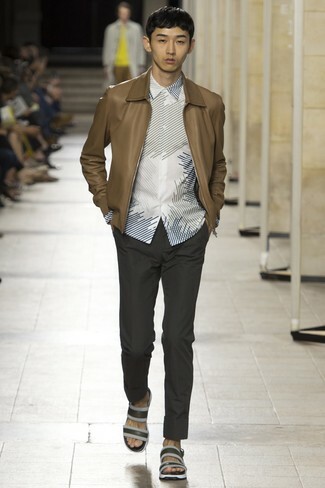 For a laid-back outfit with a fashionable spin, opt for a Cole Haan Washed Leather Moto Jacket and black chinos. Finish off with a pair of black leather sandals to upgrade this ensemble. 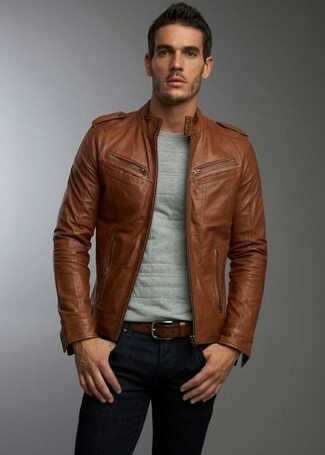 Consider pairing a Cole Haan Washed Leather Moto Jacket with black skinny jeans to achieve a razor-sharp and modern-looking off-duty outfit. 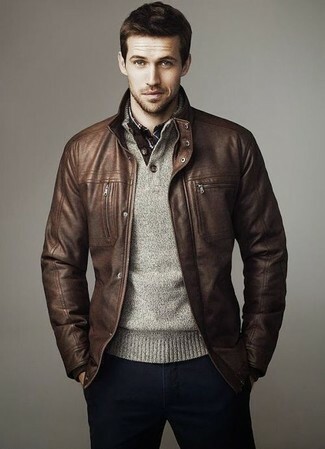 This relaxed combination of a brown leather bomber jacket and navy chinos can go different ways depending on how you style it out. 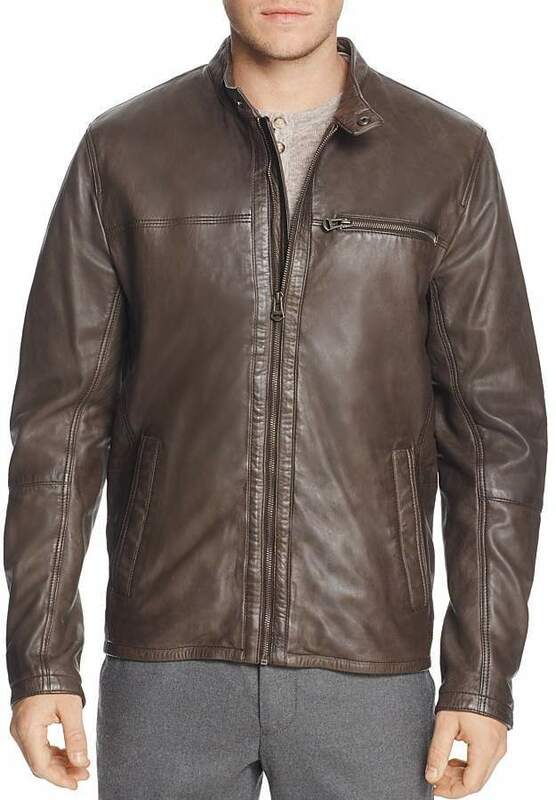 Try pairing a Cole Haan Washed Leather Moto Jacket from Bloomingdale's with navy jeans for a casual kind of class. A pair of brown leather casual boots will bring a classic aesthetic to the look. 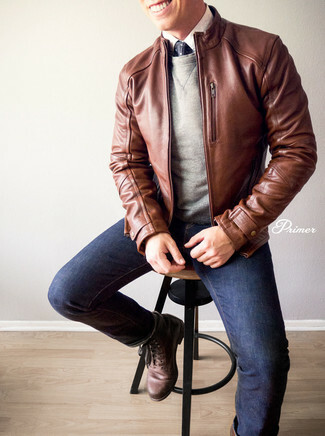 This combination of a brown leather bomber jacket and navy jeans is definitive proof that a simple casual ensemble can still be truly sharp. 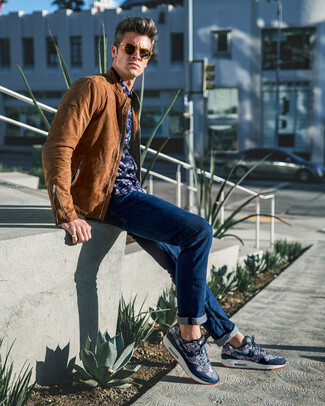 Send this getup a sportier path by slipping into a pair of navy print athletic shoes. Go for a simple yet laid-back and cool outfit by opting for a Cole Haan Washed Leather Moto Jacket from Bloomingdale's and navy chinos. Grey athletic shoes will add a whole new dimension to an otherwise standard ensemble. This casually cool getup is so simple: a Cole Haan Washed Leather Moto Jacket from Bloomingdale's and grey plaid cargo pants. 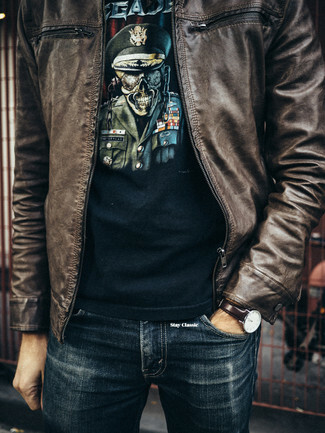 This combo of a brown leather bomber jacket and navy jeans is very versatile and up for whatever's on your itinerary today. 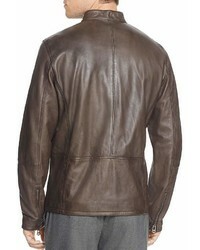 A Cole Haan Washed Leather Moto Jacket and blue jeans will give off this cool and relaxed vibe.